Author's note: If you are not familiar with Jeremiah (TV), maybe you should read 'Woman behind glass' first, to learn more about Meaghan's situation. Meaghan closed her eyes, she enjoyed the coolness of the night on her skin, the gentle wind blowing through the broken windows of the old ruins. A feeling that she wanted to take in; she wanted to remember, later, when she would be locked-in again, deep under the mountain, isolated from the world by thick glasses. Markus tried everything to make her life as bearable as possible. Most in the Mountain would probably envy her for all the comfort she had: a king-sized bed, a cozy chair, a shelf full of books, pictures on the walls. A place all for herself. You couldn't found many places like this in the Mountain anymore; too many people were looking for a refuge, for a place where they could live in relative safety instead of facing the struggle for life every day anew in a world where the chaos rules. They didn't know that the death was living so close to them. The rare moments of freedom Markus allowed her now and then could be fatal for everyone. A touch of her hand and the virus would wake up again, would kill everyone in the mountain, apart from the children. Meghan forced her eyes open again. 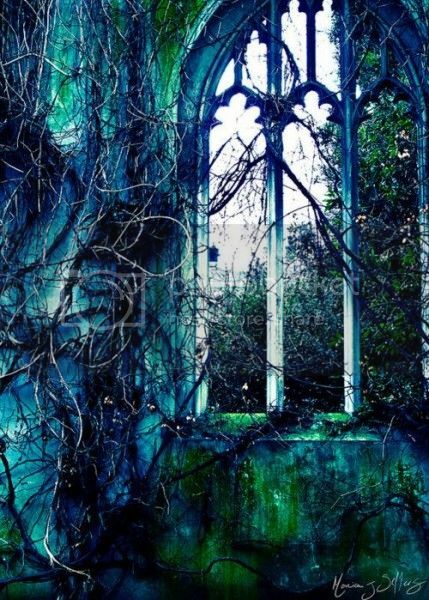 a faint moonlight fell into the ruins of the old church, bathed everything in a mysterious green - blue light. She let her fingers running over porous, ancient rocks, creeper, and roots of the plants who had taken over the building long ago. When the thorns of a rose pricked her fingers, she smiled and welcomed the pain. "It's time to go back." Markus' familiar, gentle voice, muffled by the thick helmet he wore to protect himself, tore her out of her oneiric state. A last glance into the sky, the faint moon, a cool breeze on her cheeks, like a last touch for goodbye. She forced her tears back when she nodded. Poor Meghan. She has a life that is no life. Yes, it's hard to imagine to live a life like she does. I like her character so much.